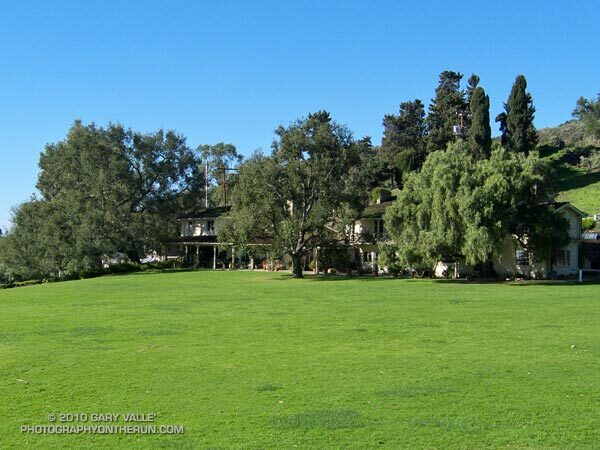 Running down the service road toward the polo field, the lawn of the historic 31-room ranch house was impossibly green. Several inches of rain and the low angle of the Winter sun combined to produce a green of remarkable vibrancy. I was about 10 miles into a 21.5 mile trail run in the Santa Monica Mountains, winding my way through Will Rogers State Historic Park. The popular park consists of the ranch house, polo field, stables, riding arenas, picnic areas, and hiking trails. Built in about 1926, the ranch was deeded to the State of California as a historic park in 1944. And about that green lawn; I guess it just makes sense that a western ranch with a polo field would have a four hole golf course that doubles as a front lawn. Here’s a brochure and a self-guided tour from the Park’s web site.